It's their anniversary yet the gift is for you. 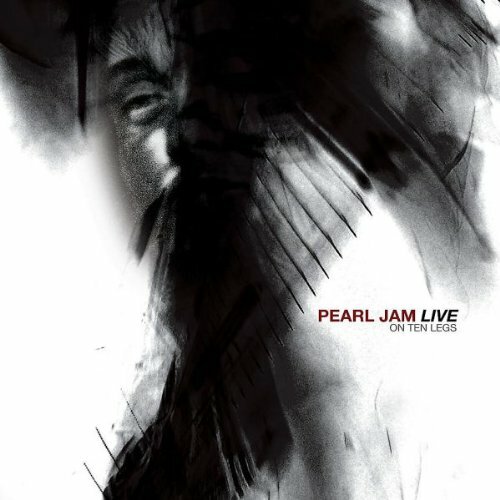 Pearl Jam begins the celebration of their 20th anniversary with the compilation album Live on Ten Legs, the title playing off 1998's Live on Two Legs, a previous "official" live album. The tracks were recorded during world tours occurring between 2003 and 2010 and have been remixed. Unfortunately for those obsessed with details, they don't identify when and where the songs were performed. Normally, my preference for a live album is an audio document of a single performance rather than a best-of that allows a band to hide its mistakes, but considering Pearl Jam has improved upon the Grateful Dead business model by making available "bootlegs" of every night from all the tours covered during this period, they can do whatever they please. Ten Legs finds Pearl Jam looking back in its rearview mirror. They perform four tracks from their recent release Backspacer; four from their debut Ten if you include B-side "Yellow Ledbetter;" and at least one song from every album except No Code, which is a personal disappointment as it's one of my favorites. There's a mix of popular and lesser-knowns songs that should please fans of different levels of devotion. I usually prefer the latter over those overplayed on the radio, but the recent tragedy in Tuscon, Arizona makes "Jeremy" unfortunately timely and powerfully resonate. The real treat for fans is the inclusion of rare covers that the band have so far only played on the European leg of their 2010 world tour. Demonstrating affection for British punk rock artists, they open the album with Joe Strummer & the Mescaleros' "Arms Aloft" and later perform an awesome version of Public Image Limited's "Public Image." Pearl Jam sounds in very fine form throughout. Eddie Vedder's vocals are strong and never get lost in the mix. Mike McCready's guitar work on "Nothing As It Seems" is particularly impressive. The rhythm section of guitarist Stone Gossard, bassist Jeff Ament, and drummer Matt Cameron is consistently solid. I didn't notice keyboardist Kenneth "Boom" Gaspar much on the disc but he really shines on "Alive." The extended bridges on both "Rearview Mirror" and "Porch" showcases their working in harmony together and pushing themselves as musicians. What's been most impressive about Pearl Jam is the way they excel running at different speeds. "Spin the Black Circle" is frantic and ferocious, and just as satisfying is the gentleness of the acoustic "Just Breathe," which is reminiscent of Vedder's work on the Into the Wild soundtrack. Although it's mostly on older tracks like "Animal" that the crowds get the most vocal, every audience sounds enthusiastic. One can be heard clapping along to the opening of "Unthought Known" as if it was a old classic in their catalog. While Live on Ten Legs won't make any new Pearl Jam converts, those who don't already own multiple live versions of these songs will be pleasantly surprised with this anniversary present from the band. Hopefully there's more to come.